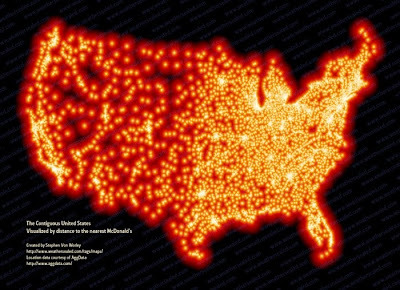 “There are over 13,000 McDonald’s restaurants in the US, or about 1 for every 23,000 Americans. But even market penetration this advanced doesn’t mean that McDonald’s is everywhere. Somewhere in South Dakota is the McFarthest Spot, the place in the US geographically most removed from the nearest McD’s. If you started out from this location, a few miles north of State Highway 20 (which runs latitudinally between Highways 73 in the west and 65 in the east), you’d have to drive 145 miles to get your Big Mac (if you could fly, however, it’d be only 107 miles).